The original provisional patent for Attention Based Currency (ABC) was drafted by Tess Gadwa, then CEO of Yes Exactly, Inc., in early 2014. A working prototype of Attention Based Currency was released roughly 18 months later. This demo and repo may be viewed with permission. Over time, the founders of Attention Based Currency came to believe that a foundation model was superior to a for-profit corporate structure. The decision of Bitcoin innovator and proponent Gavin Andresen to join the Attention Based Currency Board of Advisors in July 2015 was instrumental to this decision. As a result of this shift in direction, the founders of Attention Based Currency made the collective decision to withdraw their patent and instead release their work under the open source MIT license. 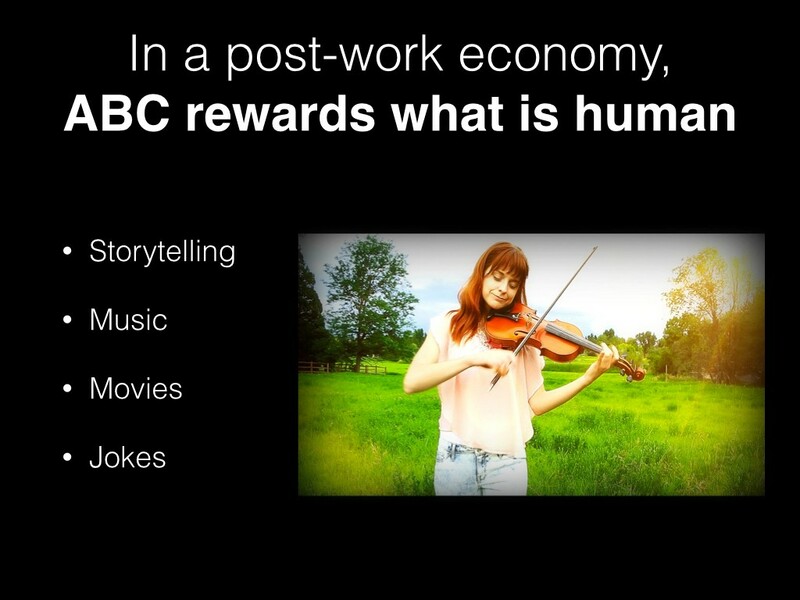 Founders Tess Gadwa and Erik Amlee presented their findings on ABC as a solution for Universal Basic Income in Seoul, South Korea in summer 2016. Click here to view the presentation and read the published BIEN journal article, authored by Tess Gadwa and Scott Little, Ph.D. In the wake of new research findings regarding the steep energy costs of even "alternative" mined cryptocurrencies such as Litecoin and XMR, we have shifted our focus to greener DAPP protocols such as Holochain. We welcome new contributors who understand the potential of human-powered currency and the unique properties of "taste" as a variable that, in a correctly structured system, is challenging or impossible for machines to game. Look for the launch of our service, providing tradable, cryptographically signed rewards for content discovery, curation, and trendspotting, in 2019. Please contact us to view the current whitepaper. To upload music or sign up for the listening service in advance, visit millionsongmixtape.com.